We have each adapted habitual patterns. Researchers estimate that 95% of our behaviors are, in fact, habits. The benefit is that we take actions without expending a lot of mental energy for decision-making. Many of our habitual patterns serve us; however, some are no longer useful. The challenge is becoming aware of our patterns and making choices about what will support us in achieving our goals. It is useful to appreciate that we each have blind spots. I often coach executives who do not see that some of their behaviors are causing them to fall short of achieving their goals and even derail in their careers. Often, when under stress, leaders exert more of their habitual patterns that are hurting them such as not listening, criticizing, ignoring or becoming defensive. It is useful to make it a practice of noticing your thoughts. You may find that you are constantly criticizing someone or yourself, complaining about too much to do and feeling stressed about a situation. One of my clients realized that she felt overwhelmed by the need for a reorganization in her department and having a new boss. Under such stress, she buckled down to work and developed the reorganization plan without consulting or including others. She also failed to inform her manager about the changes she was making. There was a lot of resistance from the staff, and her manager did not support her since he was excluded from her planning, as well. The disruption cost her on many fronts. Upon reflection, she realized that her habitual pattern when under stress is to hunker down and do the work herself. This pattern served her in childhood and college, as well as when she had an analyst role earlier in her career. However, the habitual pattern of doing the work herself did not work in a managerial role. Another executive found that he was extremely hard on himself. He would take on very difficult and visible projects and did not appreciate his contribution and success. Despite his accomplishments, he did not feel confident. He realized that he had a habitual pattern of immediately starting new projects and had an inner voice saying “don’t show-off” that served him in his humble family. By becoming aware and consciously appreciating his contributions, he was able to be more relaxed and confident. Because we had created a safe place to explore their habitual patterns, each of these leaders became aware of what triggered their behavior and explored and chose new options that supported them in their goals. While it is not easy, it is useful to stop and reflect. You can ask for feedback and often people will be glad to share if they sense you are open to learning. You can ask others to collect perceptions and engage in a formal coaching process to learn more. A key for success for leaders and anyone is to become self-aware and then make choices that support your goals. 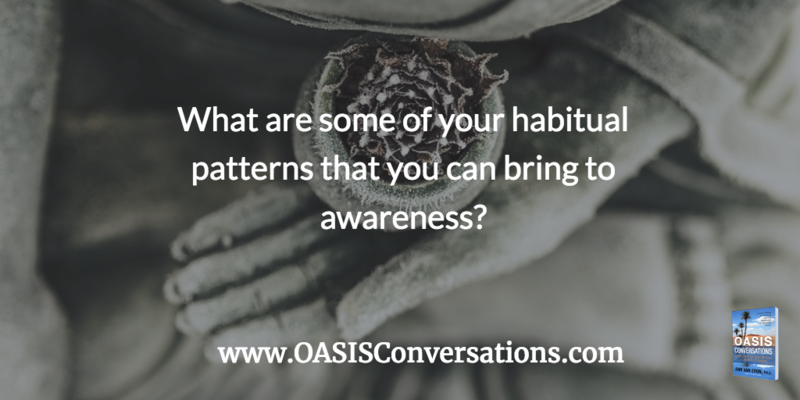 What are some of your habitual patterns that you can bring to awareness and subsequently be at freedom to choose what will best serve you in your current situation? Contact us at any time with your thoughts.